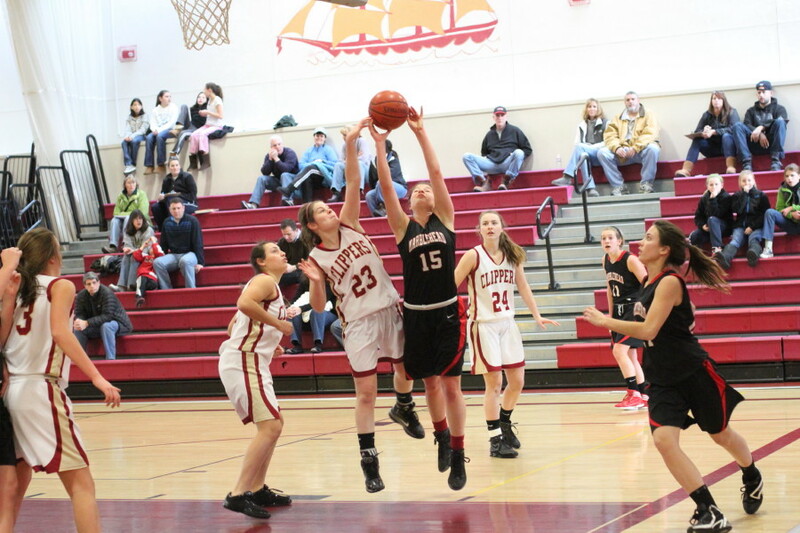 Beth Castantini (20 points) puts up a lefthanded layup. Emily Freedland (8 points) defends Aly Leahy (12 points). 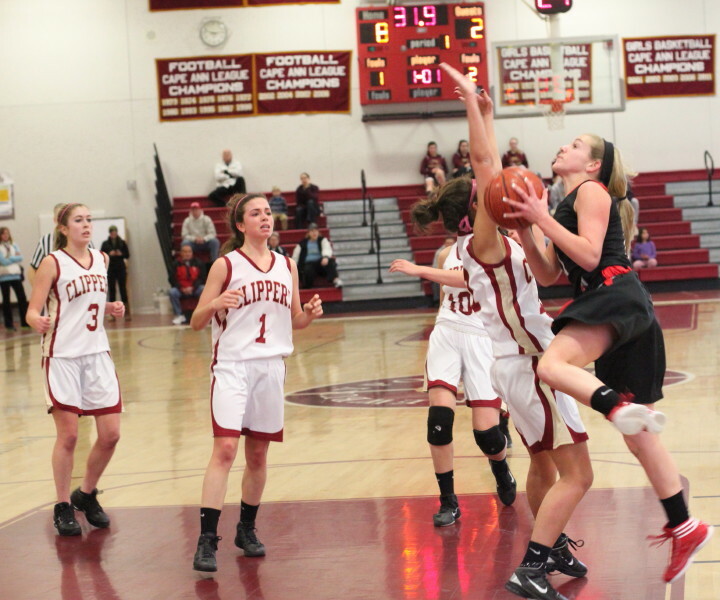 (Newburyport) Newburyport defeated non-league Marblehead, 43-25, thanks to dominating (16-3) final quarter on Monday (MLK Day) afternoon at NHS. This game was as much about who didn’t play as it was about who did. Kathryn DiGiammarino and Sydney Pliner for the Magicians and Molly Rowe for the Clippers did not play. All three girls had injuries. Let’s just say both coaches (Greg Dollas & Skip Likins) were looking at Plan B in this matchup. 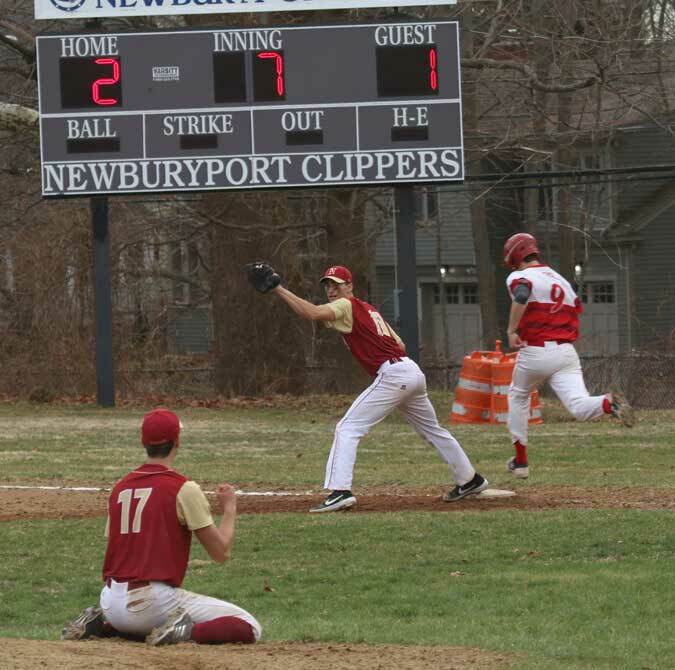 How did Newburyport (8-3) win the game? The Magicians had no answers for Beth Castantini. The Clipper senior saw large and small defenders but never was discouraged from taking shots and putting up twenty points. 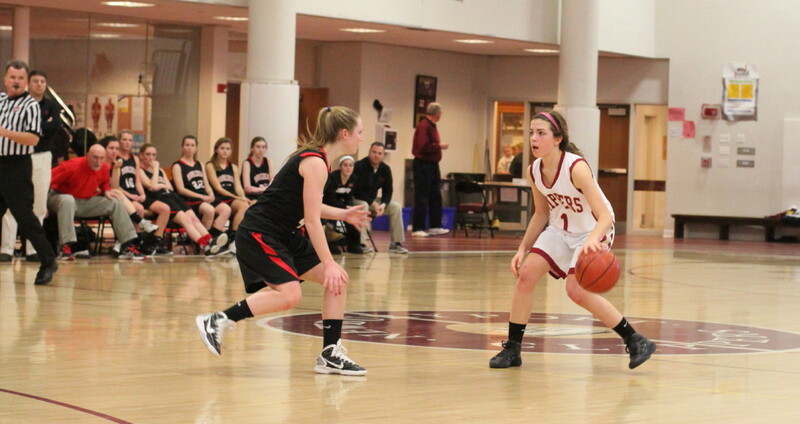 She dominated the boards and held Marblehead’s inside player (Lindsey Cohen) to a quiet four points. Minus someone to defend Beth, the Magicians (7-5) were going to have to score a lot of points to win. But, this is one of those games where the final score would give the wrong impression of how the game went. That’s one of the reasons I script games……so I can sort games out for those who are interested yet couldn’t attend them. 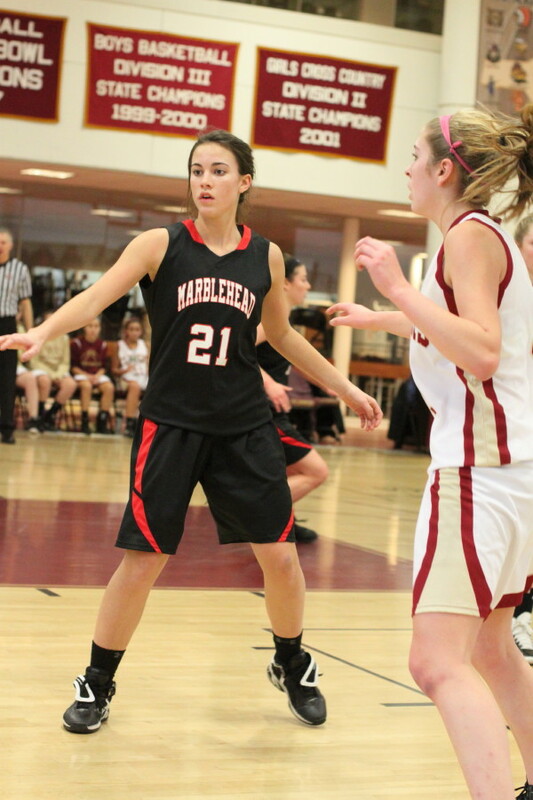 Marblehead, despite its undermanned status, was very much in this one until the final quarter. How? They refused to go away. Down 15-4, after four minutes in the second period, they put together a 12-4 response to trail just, 19-16, three minutes into the third quarter. The Magician rally featured making eight of ten free throw attempts plus two McKenna Barrett layups. The visitors completed the comeback when a McKenna jump shot tied the score at 22-22 with only a minute to go in the third quarter. 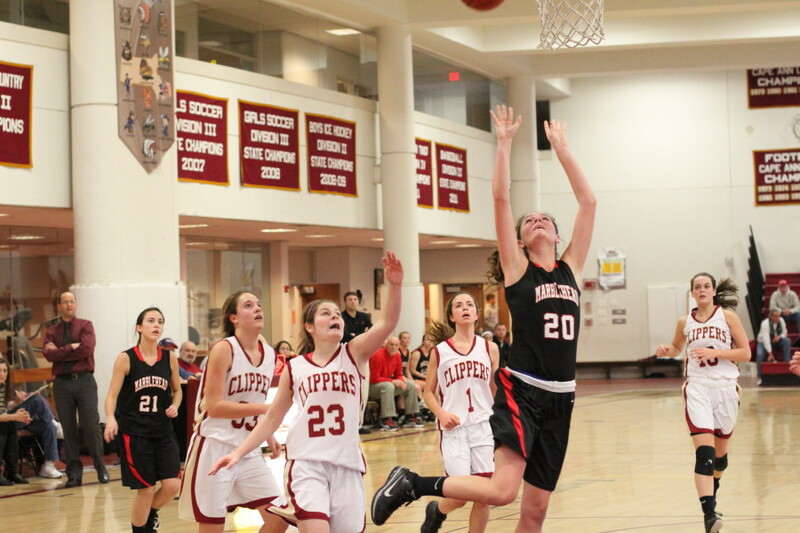 Unfortunately, for Marblehead, the rest of the quarter shows a Beth Castantini triple, two missed free throws (Mia Bongiorno), and two Aly Leahy free throws – 27-22 after three periods. The fourth quarter started harmlessly enough – an Emily Freedland layup and a McKenna free throw surrounded a Beth Castantini converted rebound of her own miss – 29-25 with 6:50 left. No one on hand expected what happened the rest of the way. 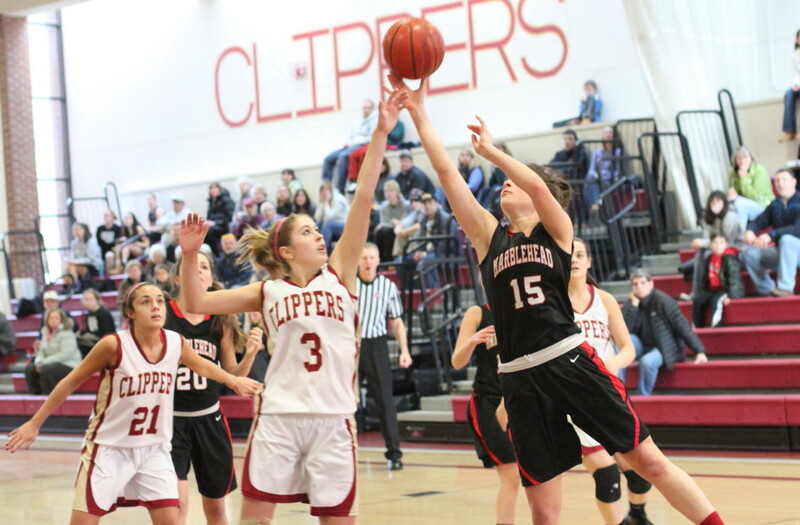 Marblehead didn’t score another point while the Clippers totaled fourteen. That’s a long time to go scoreless……and very frustrating to be on the scoreless end. 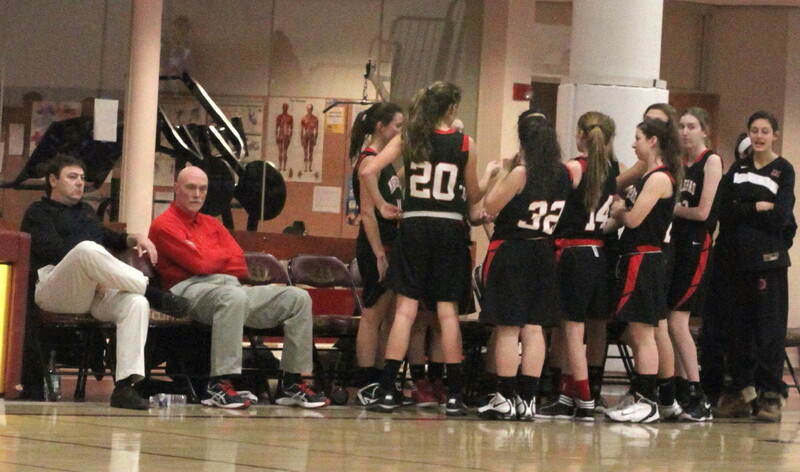 Coach Skip Likins picked up a technical near the end and was seen looking for the names of the officials afterwards. 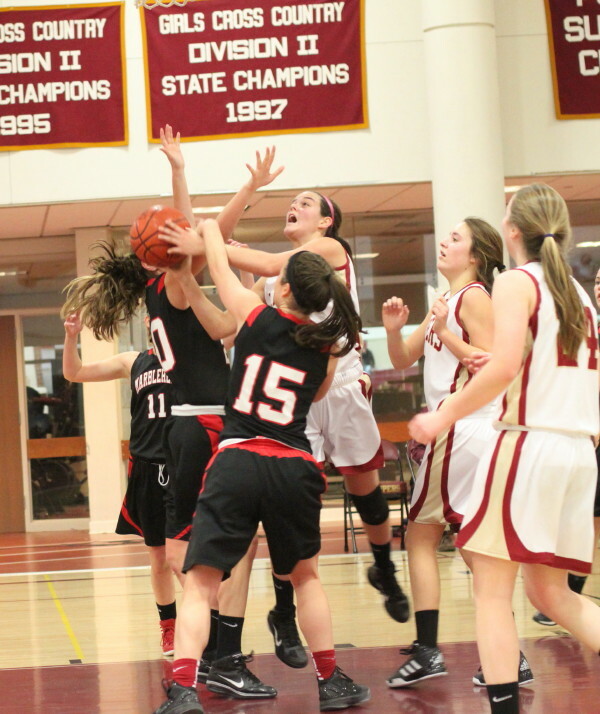 Aly Leahy (12 points) scored seven in the final run including 3-of-4 from the foul line. 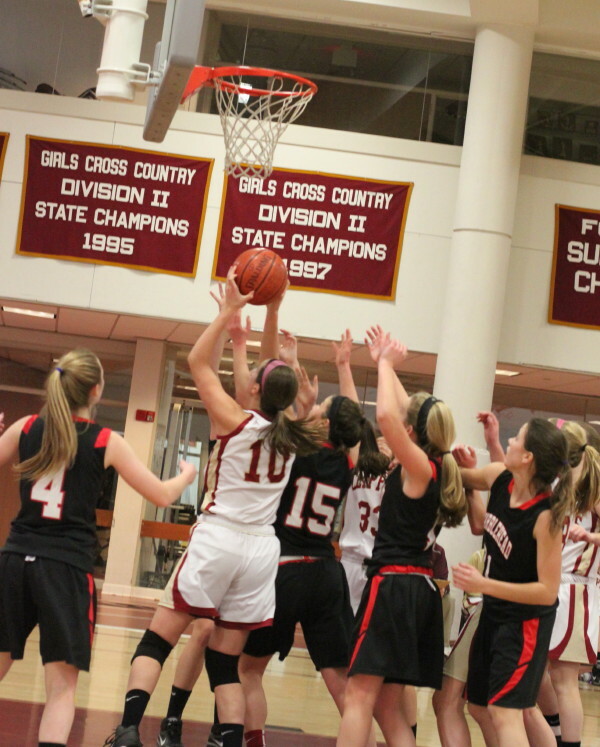 Emily Freedland was Marblehead’s top scorer with eight points. The effects of an afternoon holiday game? The Clippers missed five shots on their first possession and neither team scored during the first four minutes. 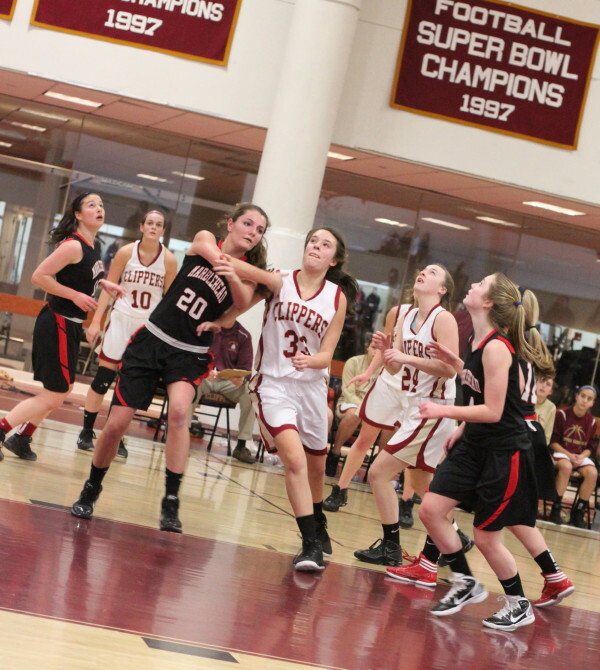 A key in this game was Aly Leahy’s ability to handle Marblehead pressure. Usually she shares that responsibility with Molly Rowe. Molly was in uniform and looked ready to play despite an icepack on her knee before the game. Instead, she sat this one out next to her father on the NHS bench. Newburyport’s next game is home on Friday night against North Reading. Why is this entry so late? Good question. I had the opportunity to go to the Celtics reunion with Kendrick Perkins (Oklahoma City Thunder) and took it. TNT made a game that started shortly after eight last nearly three hours. Then the ride home……….Route 1 and 128 snowy, icy and untreated! That resulted in an arrival time home (Newburyport) after 12:30AM. That’s the best excuse I could think of for the delay………and I’m sticking with it! 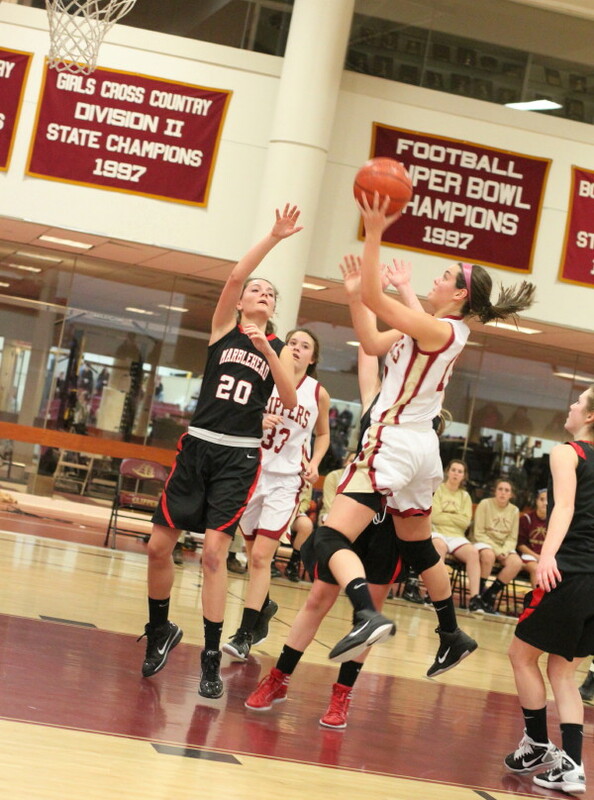 Lindsey Cohen shoots – Casey Barlow defends. 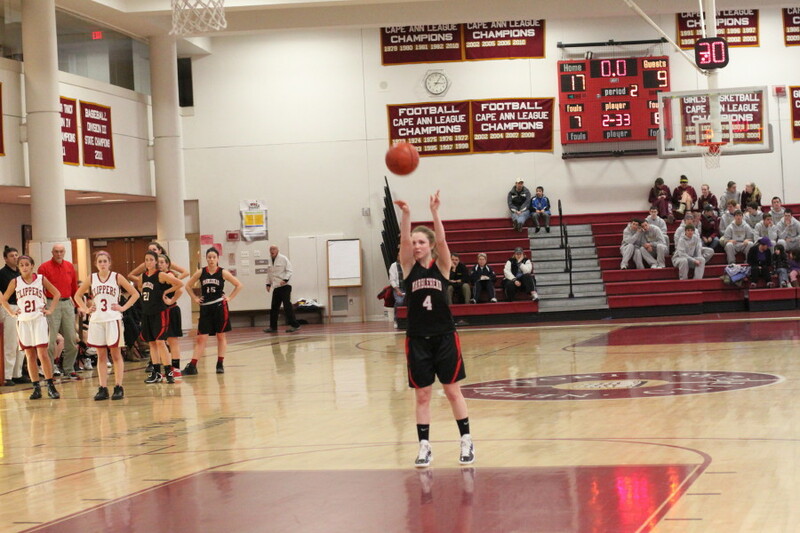 Emily Freedland shoots free throws at the end of first half.